Half of learning to enjoy Motherhood is setting your expectations at the right level. This applies to many aspects of Motherhood but especially the family vacation. Last year we took our first family vacation with our four kids! Due to my husband having a few really tough years working extremely long hours as well as having tiny littles, it had been quite a while since we had all been on a nice week long vacation. It was well overdue. Some really fantastic vacation loving friends of ours, who do not like camping, gifted us with a certificate to rent a pop up camper for a week. It was exactly what we needed. Because we are the nuts, camping loving kind of people. Before kids we would go camping and it went something like this: The day of the trip we packed our stuff, stopped at the store on the way to pick up food and drove to the site thereupon setting up camp and relaxing. We loved those days of cooking food over a hot fire, no rush to be anywhere, spent time at the beach, stayed up late playing cards by the light of the lantern, slept in each morning and the biggest pest we could possibly have dealt with was some mosquitos. Fast forward to camping with four kids ages one through seven. I knew it was going to be a different kind of camping trip than our “before kids” camping trips. It took days to pack and make sure I didn’t forget anything. I went shopping, then I went shopping again because my husband forgot to tell me the tradition his family had of miniature individual cereal boxes for breakfast, no problem! How could I say no to that adorable request? Whatever adds fun to the trip. Then the getting ALL THE THINGS to the campsite. Luckily we chose to enjoy the local state park campground because it took two van loads to get everything there. Food, Clothes, Firewood, Bikes, Backpack Carrier, Beach Towels, Pack N Play & Camp Chairs. That Summer as we prepared, I prepared myself too, you know the whole expectations thing? I told myself that this is an adventure, not a vacation. And it was. It wasn’t a vacation because as a Mom it was TONS of work. Not just the preparation but while we were camping as well. The first night we slept in the camper I had so much anxiety about the Little Brave sleeping that I was awake the entire night. Seriously, wide awake. Every time a car drove through the campground I waited to hear a child wake up and start crying. Of course everyone was sound asleep except me, I was an exhausted Mama Bear. Two of the nights I actually brought Little Brave back home to sleep because I was so tired from not sleeping in the camper. I got up early with the baby and met the rest of the family back at the campsite in the morning. It seems hysterical now that I actually did that but I was just so tired. I felt guilty at first then I realized that more than my family needing me to be there the entire time, they needed me to be rested as well. When I arrived the next morning they were all barely rolling out of bed and I was there to greet them with donuts from the local bakery. It was all good. On top of all that there is the whole campsite thing. Keeping a just turned one year old entertained at a campsite? It’s quite the laugh! He was climbing and falling on everything and was constantly drawn to the fire pit whenever we had a fire going. We learned to keep away from the campsite as much as possible because he was on the verge of an ER visit unless we were away from the campsite. So we kept busy. This wasn’t technically a vacation for my husband either because everything was just Go, Go, Go. Here is the thing though. We had a blast. For our kids, it was the highlight of their life. They were as geeked for our camping trip as most kids are for Disney. As we arrived at the campsite with everything all set up and ready, they were giddy with excitement that lasted all week long. To them, it was all amazing. We took them on all the nature hikes around Holland State Park we would typically have run out of time for, brought them out for famous Corn Dogs at Pronto Pups in Grand Haven, took them for Ice Cream at The General Store where we went for ice cream when we were kids, spent tons of time at the beach including a rare day with 80 degree Lake Michigan temps, made Hobo Pies for dinner one night and rode bikes to the Lighthouse. Honestly they were pretty thrilled just to read books in the camper! It was the adventure of their lives and therefore it was the time of our life. I’d take an adventure with my kids over a vacation without them every time. Hands down. There will be time for boring vacations without our kids someday. For now we will enjoy sharing their excitement over everything we no longer get excited about along with all the work that comes with it. They loved that camping adventure so much that imagine their disappointment earlier in the spring when we told them we would be taking our next Family Adventure to the Smokey Mountain National Park in Gatlinburg, Tennessee. We laughed as their faces fell when they realized we wouldn’t be staying in a pop up camper but would instead be renting a 3 bedroom cabin in the mountains. They cannot help but think our camping vacation was the best ever. It some ways it was the best ever. It made me brave. Even if I did chicken out of a few nights in the camper, we made the effort! It made me ready for our next big adventure. We tried something most people never would and reaped the consequences as well as the abounding rewards. Through the eyes of our young kids, we gave them the best our ourselves, our time. What kid wants more than that? It doesn’t have to be easy or fancy it just has to be you, putting in the work, making memories that will last a lifetime. I have my expectations all set. I am ready for the work, the sweat and possible tears as we make our way south this weekend to hike in the mountains. We have a toddler after all, so the tears are a guarantee! It wouldn’t even be a normal day at home without them so our trip won’t be any exception. You expect tears on an adventure as well as the fun. On the 10 hour drive home we will be sure to have more tears, unless we have all exhausted them from the fun of the adventure first. They might be too tired to cry! This Mama Bear is ready. I will make myself brave for my littles. And we are ready to chase it. 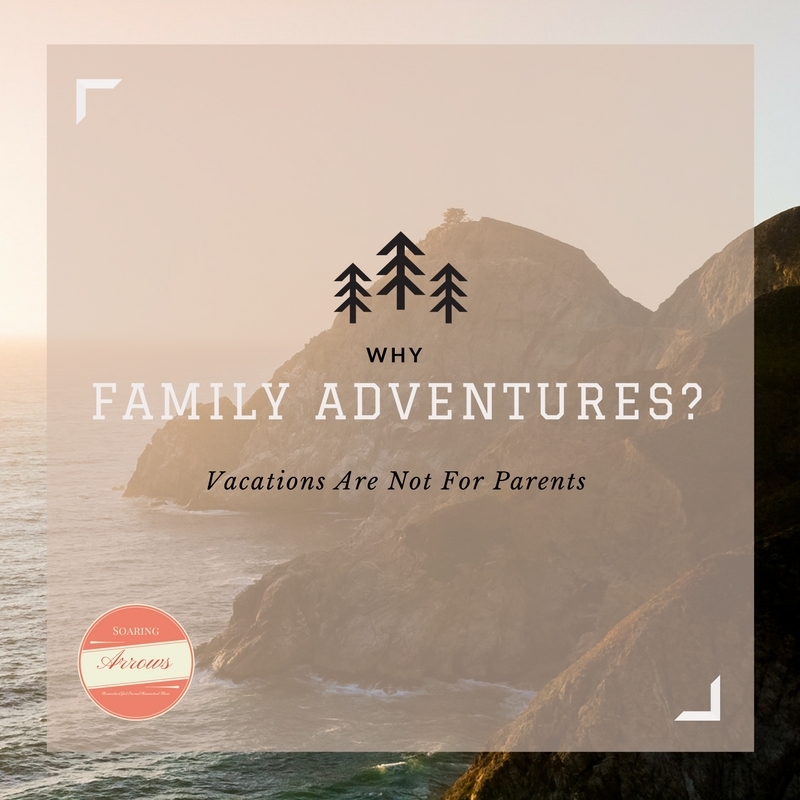 What do you do to enjoy the work of family adventures? If I’m brave enough to take 8 kids under age 12 on a “vacation” I need the evidence of all the fun we had together. Looking back at our memories in photos reminds me that all the hard work is worth it. Our every day lives are filling with adventures. Don’t forget to capture it. Love this post! And so timely! We are planning our first family camping trip at the moment! We are so excited and the kids don’t even know yet! Camping is something we absolutely loved, even going with a one year old! Next year we plan to buy a camper and do even more which I am thrilled about. I hope your family enjoys your camping adventure as much as we did!